Tooth loss is a simple yet alarming oral health concern that has already put a threat to a huge number of Australians today. This condition shouldn’t be disregarded as it can highly lead to a bigger and more serious illness and may affect the quality of your life later on. Because of this, looking for preventative ways to deal with tooth loss is recommended and emphasised. But worry no more as your trusted dentist in Bondi can give you a hand in protecting and preserving your delicate teeth. You should know that teeth need extreme care and attention though they are made of greatly durable materials. See to it that you brush your teeth twice a day, use dental floss daily and engage to your regular dental check-ups to safeguard the well-being of your smile. 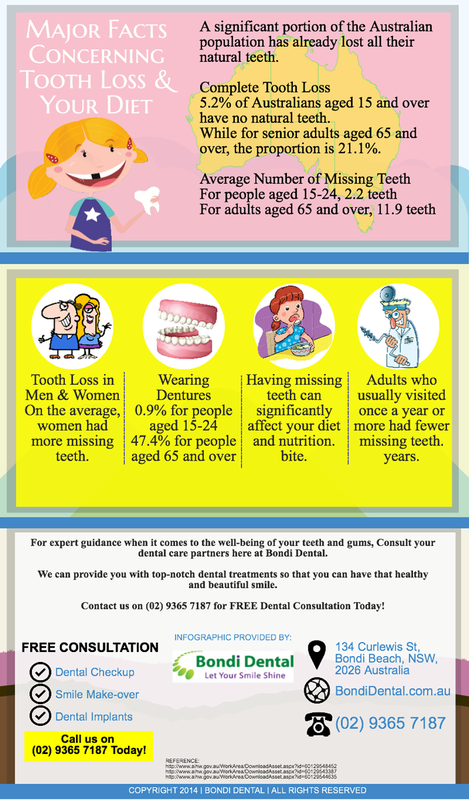 To enhance your knowledge about dental and oral wellness, consult us here at Bondi Dental. We apply our expertise when it comes to modern dentistry to provide you with top-notch dental and oral health care. You can be sure that at the end of the day, we help you gain a beautiful and healthy oral condition. Claim Your FREE Consultation: Call us today on (02) 9365 7187 or simply book your appointment online. Here at Bondi Dental, we let your smile shine.